A fantastical resource for integrating the fey into campaigns, for players and GMs alike! What happens when immortal infatuation breaks forth into the world of mortals? Faerie Passions holds the answers, with advice and optional rules for GMs as well as new character options for characters. Faerie Passions explores the mindset of the fey and their motivations when interacting with mortals and a world that is not their own, richly illustrated with detailed examples. It also engages children of mortals and the fey, the legacies of love (or lust) left behind in the wake of the often fleeting or turbulent romance between lovers that are worlds apart. Finally, you will find within these pages five new fey-themed sorcerer bloodlines from nymphs to norns, as well as a pair of archetypes devoted to a closer relationship to all things faerie: the feyfriend druid who desperately wishes to be like them in every way, and the fey hunter ranger who wishes only to get close enough to kill every last one for spite and vengeance on the Fair Folk who wronged them dearly once upon a time. 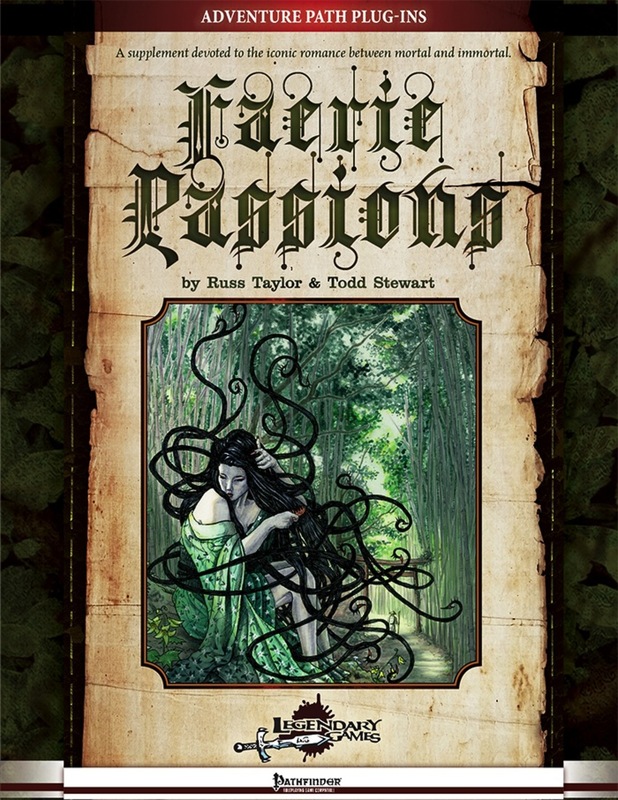 Ideally suited for use with the Kingdom-Building Adventure Path or for any campaign where they fey play a significant role, Faerie Passions is brought to you by the authorial team of Russ Taylor and Todd Stewart making their Legendary debut, with marvelous artwork by the esteemed Mike Lowe. Add this 18-page to your collection today, and Make Your Game Legendary! This supplement is 18 pages long, 1 page front cover, 1 page editorial/SRD, 1 page ToC, 1 page how-to-use, 1 page advertisement and 1 page back cover, leaving us with 12 pages of content, so let's take a look, shall we? After a 1-page introduction to the matter at hand, we are introduced to something vital to understand the content herein - the mindset of the fey: We essentially get advice for DMs to portray fey and their interaction with mortals and PCs in particular: The alien nature of fey and their capacity to misinterpret mortals is reflected by optional supplemental rules that govern the interaction of fey and mortals and reflect the anxieties of such a clash of mindsets and cultures. Furthermore, the fey's sense of beauty and how it governs their actions is also described and supplemented - and yes, fey make start developing an obsession to "fix" your own sensibilities...which may be annoying with humans, but in the case of fey, it may become downright cruel and disturbing... Speaking of which - the arrogance and weird logic of fey offers quite an array of storytelling potential and examples via a rusalka and her taboos on drowning victims are3 covered - oh, and it should be noted that trying to influence fey via mundane and magical means can be rather problematic and fire back upon the mortals that attempt it. The aspects of faerie whimsy, potential sheer heartlessness and the time-honored tradition of humbling proud mortals - all of these are covered herein and come with short, easily inserted rules that add a layer of depth to the interaction with fey. Now onwards to the birds & bees of fey - examples from true fairy-tale love to forced ravishments of woodcutters by dryads to the stable of lovers held by noble fey, we get some intriguing short summaries of central tropes to the fey's lore and their potentially child-stealing/exchanging ways also merit some further focus by the book and help prospective DMs with advice on properly adding interesting features to the changelings or to create more unique offspring with the ARG. The book also offers a fine array of awesome recommendations for further reading, both obvious and lesser known. having read the majority of these myself, I can attest to the inspiring nature of these recommendations. Now if you're like me, you'll consider the basic fey-bloodline too generic to reflect all possible ancestors and hence, herein, we get an array of alternate bloodlines for sorcerors that reflect the respective parents better -now all of these bloodlines make the respective character counts as fey for the purpose of spells and abilities as well as archetypes - i.e. these are considered variants of the fey bloodline. First would be the Dryad, which of course gets plant and forest-related abilities and bark-like skin at later levels. Nymph-blooded sorcerors - this one is, of course, rather focused on charm and grace and allows you to temporarily add a significant bonus to AC temporarily and even gain an aura that dazzles those that look directly at you - thankfully suppressible, though. Nereid-blooded sorcerors may hit adversaries with cold water spouts, become invisible and get a nice array of water-related spells. Among the more uncommon bloodlines would be the Norn, who may provide detrimental or beneficial modifications to rolls and even enforce rerolls. Satyr-blooded sorceros gain a touch-attack that has targets laugh uncontrollably and may also substitute the playing of wind instruments for verbal and somatic components - cool idea. We also get two new archetypes - the Feyfriend Druid who may be of chaotic alignment, has an array of fey-themed spells added to his/her spell-list, becomes immune to mind-influencing effects and may actually turn into giant form or take the form of fey at later levels. The opposite would be teh Fey Hunter Ranger, who gets iron will, can extend saves versus fey to nearby allies, allow them to reroll saves versus mind-influencing effects and even make attacks that can dispel the magic of fey creatures and see past the illusions of the fey. Editing and formatting, as we've come to expect from legendary Games, is top-notch. Layout adheres to LG's 2-column full-color standard and the pdf comes in two versions, with one being more printer-friendly. The pdf offers two gorgeous one-page illustrations and a smaller picture of also superb quality, all by Mike Lowe. The pdf comes fully bookmarked and hyperlinked for your convenience. Russ Taylor and Todd Stewart should probably ring some bells name-wise and as such it is no surprise that the superb ecology-style beginning of the romance and interaction between fey and mortals is a joy to read and offers some neat ideas and insights. The bloodlines could easily have drifted into the boring-territory, but thanks to a varied and non-core-rules-using spell-selection as well as some unique abilities, manage to evade that fate. The archetypes are both iconic and fun, with especially the fey hunter being extremely useful to have on your side when challenging the fey. That being said, by now the standard for fey-related supplements is HIGH. Kobold Press' Midgard has delivered perhaps one of the best modules ever as well as copious information in that regard. Adventure-a-week.com's Snow-White-Saga, while not directly and exclusively dealing with fey does indeed breathe the spirit and finally, Rite Publishing's Convergent Paths: Fey Archetypes and In the Company of Fey offer a cool race/racial paragon class and one of the best barbarian archetypes ever crafted. Whereas the Midgard and AaW-supplements are more about the tone, especially Rite's offerings lend themselves well for direct comparison. Convergent Paths: Fey Archetypes especially would spring to mind - and while it has parts I consider not 100% compelling, it feels a bit more...daring. While I'm not a big fan of "The Laughing Man", said archetype feels more innovative, more daring, more alien than those herein. In fact, I wondered for quite some time and then got it - this supplement is very conservative in its design-choices: It's well-crafted, flawless even in its respective content, but ironically it does not inspire this sense of weirdness, does not reflect the alienness in the crunch. I also consider the lack of alternate racial traits to modify base races according to parent-fey or alternate racial traits an oversight in this - either that or some actual examples of how to court varying fey (with skills or the like), a select set of taboos - either would have improved the book. Think of Catherynne M. Valente's Gaselli and the tale of the errant Taglio (Orphan's Tales Book 2, by the way) on how alien mindsets can completely transform relations between races and challenge our preconceptions. In the end, this pdf feels like a nice offering, but also woefully incomplete and perhaps a tad bit too conservative for the imagination-inciting matter it covers. In the end, Faerie Passions is not a bad book by any stretch and actually has great content herein, but it also didn't manage to either blow me away or incite its eponymous passion in me to include components of it in my game, apart from the fluff. In the end, my final verdict will clock in at 3.5 stars, rounded up to 4 for the purpose of this platform. Faerie Passions is an Adventure Path Plug-In by Legendary Games for the Kingbreaker line. The AP they reference for it has a lot of interactions with the fey, but few guidelines on how to present them, a deficit which this product remedies. It starts with a section going into detail about how the fey deal with the mortal world. It reminds us that as fey find humans as alien as we do them and possess a poor understanding of human reactions and thoughts, which can lead to catastrophe when the fey think they're about to be attacked or the like. The fey are motivated by things like a love of (what they consider to be) beauty, tremendous pride, a love of mischief and amusement, and sometimes simple feral bloodlust. But even then they have self-imposed strictures that they follow rigorously. I.e., the infamous 'guess my name and I'll let you go free' bit. It also goes into the sorts of love that fey feel for mortals and vice-versa, which can range from pure romantic love to simple lust to a desire to control and possess. And any of these can lead to children -- who can have minor physical differences of which some are helpfully listed. Or they can be something far worse, almost an eldritch abomination. Any of these can lead to inspiration for characters and plots of all sorts. It can also lead to some new Fey bloodlines, much as how the Elemental bloodline can be broken into the differing genie bloodlines. The ones given are for the dryads, nereids, norns, nymphs, and satyrs, and all of them possess enough quirks to individualize them while still being recognizably fey. The PDF also helpfully lists that 'you are considered to have the fey bloodline for purposes of effects and archetypes. If an archetype replaces an element of the fey bloodline you do not have, you give up an ability from the corresponding level instead'. Finally we get two fey archetypes, the feyfriend druid. They get a slightly different skill list, some extra sorcerer/wizard spells for their list in place of the nature bond, the ability to take the forms of giants and fey in place of elementals with wild shape, and several other changes that make this a very distinct archetype. Next comes the rather less faerie-friendly Fey Hunter for rangers. They lose some of the normal ranger abilities in exchange for ones that make them even more dangerous against the fey, such as their Favored Enemy bonus against fey applying to saves against their powers as well; the ability to use dispelling strikes and true seeing against fey and their powers; and the ability to share her save bonus with allies. This is a great archetype and one that will probably see a lot of use in fey-heavy campaigns. A great supplement, balancing fluff with crunch and truly helping to bring the fey to life for any campaign or adventure. Five stars easy! Bloodlines are dryad, nymph, nereid, norn... and SATYR! Let the revels COMMENCE! This is music to me^^ Thanks! Finally got a review up for this great product (I really love the references in it to Machen and that recommended reading list). I especially like the new fey bloodlines and the Fey Hunter archetype. The way the latter is done could also serve as inspiration for folks who want to create rangers who specialize in hunting dragons, undead, aberrations, etc. Thanks for the great review Eric! Posted and linked to our website and mirrored on twitter and facebook! Glad you enjoyed, and don't worry about Endy. He's got plenty of reviews to do, and you do just fine on your own! That said, of course, we always welcome anybody to write a review for our products. Tell us how you like it! A great review as always, End. And since you mentioned it, I ave to saree that it's a shame we didn't get this: I also consider the lack of alternate racial traits to modify base races according to parent-fey or alternate racial traits an oversight in this - either that or some actual examples of how to court varying fey (with skills or the like), a select set of taboos - either would have improved the book. Ah well, it gives LG something to do in their next fey-based supplement. Thanks, Eric! I also enjoyed your review (I always read them, you know) and while I could get behind your perspective on this one, it didn't click with me to that extent. Cheers! Thanks to both of you for the in-depth reviews! We always appreciate you taking the time to give LG products a look.